This graceful bracelet just seemed to come to life with the soft warm glow of the silk satin gold Czech Twins and the Czech Pearls. Choose from SEVEN beautiful color ways, I had a little too much fun working out the different variations! Some will be only available for a short time as I used some of my secret stash to make them! This is one bold bracelet, hence the name "Empress". It uses the new Thorn and Two Hole Chili Pepper beads. There are enough beads to make up to a 9-1/2" bracelet, if you still need a little more length it can be added at the clasp junction. 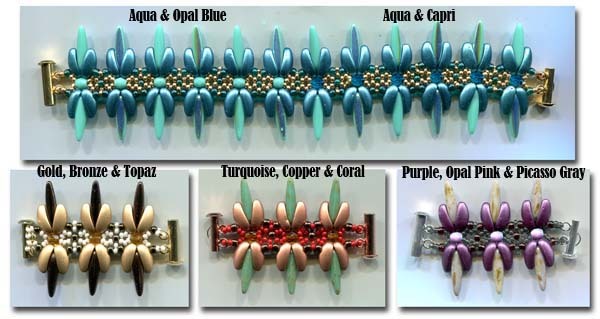 NOTE: The Turquoise, Copper & Coral is now Turquoise, Copper and Champagne AB (replaces the Coral Red). The Transparent 11/0 Charlottes in the Purple are now 11/0 Silver Charlottes. The pictures REALLY don't capture how pretty these are. Have some fun with the Czech Twin Two Holes, they can create some very unique shapes and patterns. This one reminds me of dragons. Two colors of Czech Twin Two Holes, Size 11/0 and Size 8/0 and just a simple snap clasp, it makes the clasp invisible and the bracelet seamless. Easy to put on and very secure. Enough beads to make 10 plus inch bracelet. This one lays as lovely as a necklace or a bracelet. There are enough beads in the kit to make two 9 inch bracelets or one 18" necklace. The Czech Twin Two Holes come in such great colors. The first ones I've chosen are the matte metallics and a couple of rich jewel tones. Mixed with Size 11/0 and 8/0 seed beads and a Dritz Snap-On clasp. a necklace all from this one kit! I got a carried away with the color combinations so you have lots of choices! Great beginner bracelet, it looks complex but it's really, really easy! 4mm and 6mm Glass Pearls, 4mm Fire Polish Crystals, Size 11/0 and 8/0 seed beads and a Snap Clasp complete this elegant but simple design. This is a fabulous way to use your vintage collection of buttons! This bracelet is made with new buttons, but bring your collection to class and make a one of a kind bracelet. Fast and easy to make using buttons 5/8" across, Size 11/0 and 8/0 seed beads, and 4mm Fire Polish Crystals, Druks or Stone beads. This was fun to make! Talk about sparkle and motion. This is why I call it "Butterfly Lace". The picture just doesn't do it justice, the beads don't lay flat, they look like fluttery butterfly wings with sparkle! Design uses Size 11/0, 8/0, 6/0 Seed Beads, 4mm and 6mm Round Crystals, Druks or Stone beads. Change the "T" and "Loop" with a regular clasp or button for a different look. How to make such basic seed beads sparkle and dance. Once you learn this technique you can use so much of your stash. This is a great technique to learn and then to up the bling factor by swapping out the third color of Size 6 beads with 3mm Swarovski Crystals instead! This pattern uses a variety of Size 11/0, 8/0 and 6/0 Seed beads plus an 8mm Round Crystal, Druk or Stone. The necklace is the main rosette plus a few more rows to make it a little larger and flasher for a center pendant. This delicate bracelet is quick to make once you've created your first one. You will need from two different colors of 6mm Fire Polish Crystals or Druks or Stone beads, Size 6/0 and Size 11/0 Seed Beads. It takes on a completely different look depending upon your color choice. This fun design can be made in a variety of colors. You'll need 6mm Fire Polish Crystals and Size 11/0 Seed Beads, a clasp or button if you choose instead of using the crystals. Get creative with your colors, make it an elegant evening piece, a holiday favorite, or an everyday bracelet. Talk about twinkle, twinkle little star! This one will shine anywhere! It has a bold elegance and yet it's not to heavy. It uses 6mm, 4mm, Size 11, Size 6, and Size 8 Seed Beads. Using the 6mm Crystals for the closure give it a nice uniform look without the break of a clasp. But you can add a traditional clasp instead if that's easier for you to put the bracelet on and off. The next level for those of you who've been enjoying right angle weave. Not as hard as it looks, but it uses the beautiful bicone crystals to set off the colors on the sides. You'll need two colors of Size 11/0 Seed Beads, one color of Size 8/0 Seed Beads for the outside edge, a clasp, and 4mm Bicone Crystals for the center. This is a great cuff bracelet design. This pattern shows you how to widen the pattern, you can keep increasing the width for even more sparkle and drama. Shown above using 6mm Fire Polish Crystals. You can vary the design by using 4mm Crystals which gives it a more delicate look and changing the Size 11/0 seed beads to Size 15/0. A bar clasp looks really good with this design when you make it wider. This is a classic Victorian style bracelet shown using 4mm Fire Polish Crystals, Size 11/0, 8/0 and 6/0 Seed Beads, a Sterling Silver Clasp. You will need the finest Beadalon or SoftFlex multi-strand beading wire and two crimps to complete this project. Great technique to learn and build on. 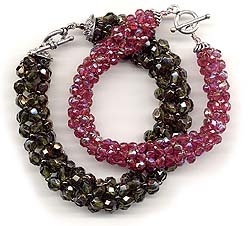 This is just one of many variations you can make with this bracelet pattern. It can be as delicate as the above design, or you can add, and add, and add until you hae a wild and crazy garden bracelet. The base of this design is perfect for making any "fringy" design using whatever you want to hang off of it, buttons, odd bead shapes, short strands of beads, whatever you can dream of to dangle from it. This design uses Size 6/0, 11/0, various leaves, flowers and a decorative button for a closure. For the project you'll need either 4mm or 6mm Fire Polish Crystal, Druks, Stone, or Bicones, in one color or you can mix since you'll use from 174-222 crystals depending upon which size crystal you choose. Plus an accent Seed Beads in Size 11/0 for the 4mm style or Size 8/0 for the 6mm style, a pari of End Caps, two Eye Pins and Clasp to finish this beautiful project. Great for beginners or advanced beaders.